Rainbow D4 12 Foot Electric Hose with Handle Part Number R5285, R6238. 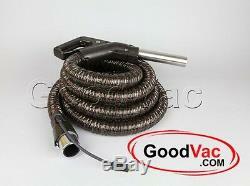 12 FOOT RAINBOW VACUUM ELECTRIC HOSE ASSEMBLY D4. 12 foot electrified hose for the Rainbow, regular hoses are around 7 feet in length, about doubles the length of hose to use. Fits Rainbow Model Numbers: SE Performance (SE PE) SE D4 (D4c) Rexair Rainbow part (spares) catalog # R5285 Alternate Rainbow Part # R6238 Included: One Rainbow 12 Foot Hose R5285 Condition: New. Each aditional item Ships at NO CHARGE! We guarantee items to be undamaged and in good working order. Missing parts or components - please check packaging material again. Item must be unused and with all original packaging and/or tags it came with. And we will straighten it out. In parts and supplies business since 2002. The item "Genuine Rainbow 12 Foot D4 Electric Hose with Handle R5285 R6238 D4C SE SE PE" is in sale since Tuesday, July 5, 2016. This item is in the category "Home & Garden\Household Supplies & Cleaning\Vacuum Parts & Accessories". The seller is "ez4every1" and is located in Palos Park, Illinois. This item can be shipped worldwide.